The best way to avoid the complications that can come along with short oil life and diesel fuel with contaminants in them is always by keeping a close eye on it . Dieselcraft can help avoid oil issues by providing you with several ways to perform oil and diesel fuel testing. You can monitor the quality of oil and fuels with diesel fuel test kits, water in fuel sensors, Tan Delta oil and fuel monitoring systems, and oil and fuel laboratory testing. 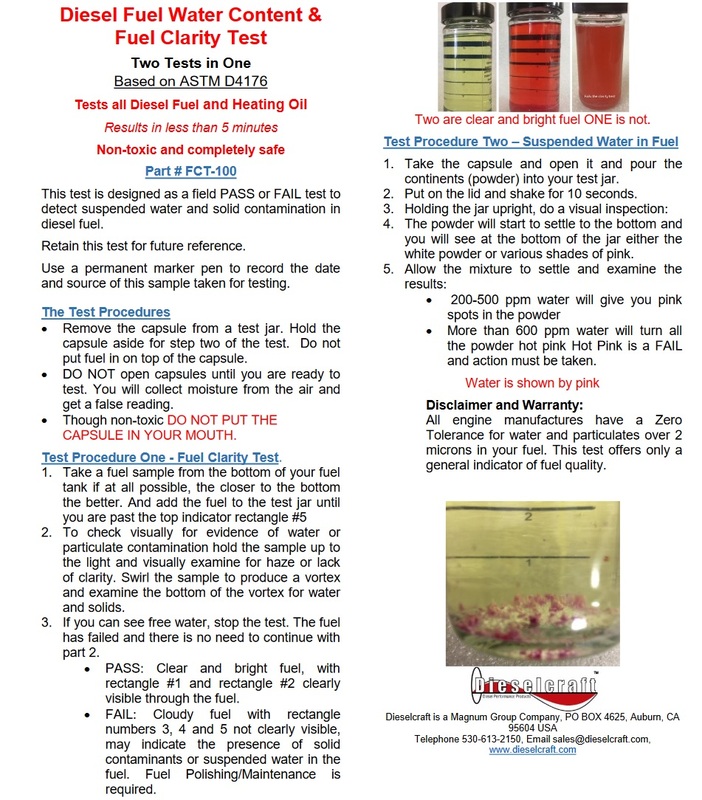 Here is some additional information on each fuel and oil testing method available through Dieselcraft. Who guarantees your fuel quality? One of the simplest ways to do fuel monitoring is by investing in fuel test kits. You can monitor the quality of fuel by contacting Dieselcraft to obtain a DS-1 Test Kit, a W-5 Water in Fuel Test Kit, or an FCT-100 Diesel Fuel Water Content & Fuel Clarity Test. They can detect the presence of water, microbes, and more in fuel and prevent you from using causing damage to your diesel engines. In addition to doing diesel fuel testing regularly on your oil and fuel, you should also put water in fuel sensors into place. The water in fuel sensors from Dieselcraft are designed to pick up on the presence of water in your diesel fuel system and alert you to it. A light will come on when water is detected, and it’ll shut off once the water is gone. Your company should attempt to monitor the quality of oil and fuels in real time as often as possible. The Tan Delta oil and fuel monitoring systems will allow you to do this. They utilize advanced technology to keep tabs on the quality of your oil and fuels at all times. The diesel fuel and oil analysis that they do will let you know if your oils and fuels ever become contaminated. Although you can monitor the quality of oil and fuels on your own by relying on the aforementioned tools, it never hurts to have an expert test your oil and fuel for you. Outside of providing companies with the products listed here, Dieselcraft can also accept samples from customers for oil and fuel laboratory testing. We’ll provide you with test kits to take the samples and perform diesel fuel and oil analysis when you send them back before setting you up with results in 24 to 36 hours. We can do ASTME standard lab testing on oil, waste oil, and diesel fuel. Do you need to have oil and diesel fuel testing done? Contact Dieselcraft at 530-613-2150 on the West Coast or at 772-215-8087 on the East Coast to hear more about your testing options.